Alvin and the Chipmunks is a music game based on the film of the same name. The game was released on December 4, 2007 and was the first release by short-lived developer Brash Entertainment. It follows The Chipmunks as they play their way from small music venues (such as a high school prom or a civic center) to massive crowds at "Burning Munk" (Burning Man) and ultimately Rockathonapalooza. The soundtrack features 40 popular songs, including "All the Small Things" by Blink-182, "It's Tricky" by Run-D.M.C., and "Heartbreak Hotel" by Elvis Presley. The gameplay itself is similar to other rhythm games such as Rock Band and Guitar Hero. Jason Lee reprise his role as David Seville in the story cutscenes while Ross Bagdasarian Jr. and Janice Karman reprise their roles from the 1980s-2000's cartoons. 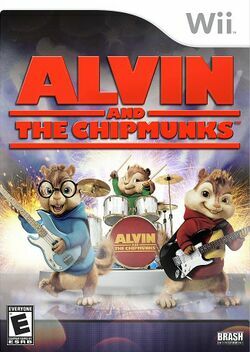 A sequal titled Alvin and the Chipmunks: The Squeakquel was released on December 1, 2009 to coincide with the release of the film of the same name. It is played in a similar way, but the venue locations are now littered around the world. Some venues allow you to play as The Chipettes (female Chipmunks who appear in The Squeakquel). This page was last edited on 20 July 2012, at 17:09. This page has been accessed 3,796 times.